We had planned to do one bistro/brasserie for lunch and an Oriental (Vietnamese, Thai etc.) for dinner but after our lovely lunch at Itineraires, we were ready for another French meal at one of our old favourites – Stella. This brasserie has been here since the 50’s and is a stand-by for locals who live in the 16th arrondissement as well as those looking for a brasserie open every day till late (they serve until 1 a.m.). 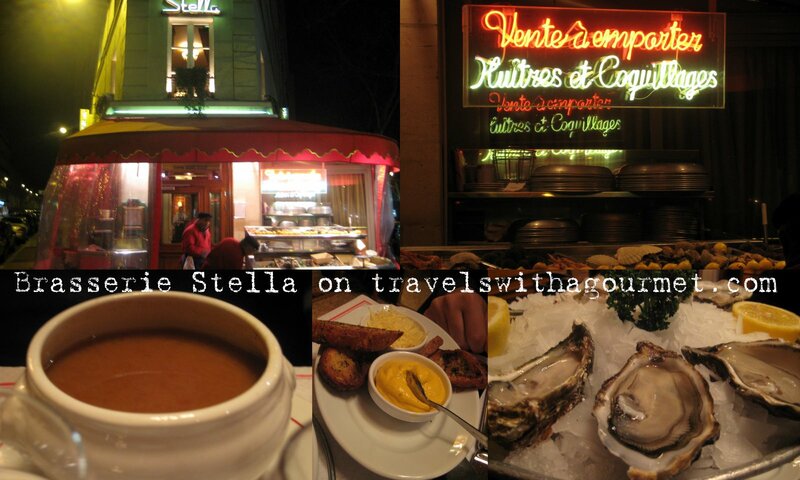 When I lived in Paris in 1992, I could hop on the 52 bus from outside our front door and get off right in front of Stella which is what I often did. Reopened in 2003, after a closure of two years, Stella is back to doing what it knows best – plateaux des fruits de mer (seafood platters), huitres (oysters) and other bistro classics like steak tartare, sole meuniere. No reservations are taken so we wrapped up warm and walked the few blocks towards avenue Victor Hugo and were given a banquette table in five minutes. The place was packed and pumping for a Saturday evening filled with chi-chi locals from the neighborhood, a few young couples and some tourists. Most were tucking into large seafood platters. We settled into our corner table and ordered right away – half a dozen Fines de Claire to start and the rumpsteak au poivre (pepper sauce) for me. A had the soupe de poisson and a steak tartare for his main course with a glass of Beaujolais. The soup came with the traditional rouille and crunchy toast. My oysters were perfect – freshly shucked and cold, they came with the classic mignonnette sauce (vinegar and shallot), brown bread and demi-sel butter. It’s been ages since I’ve had fresh oysters since I was pregnant most of 2008 and came to Paris last year without eating any fresh cheeses, shellfish or raw meat/fish. I could have had another half dozen or would have liked to share a large seafood platter with A , but he isn’t a shellfish fan so ‘ll save that for when I’m with my mom who loves oysters and shellfish as much as I do. Next came the rump steak which was saignant (rare) and very peppery with hot, crunchy frites. 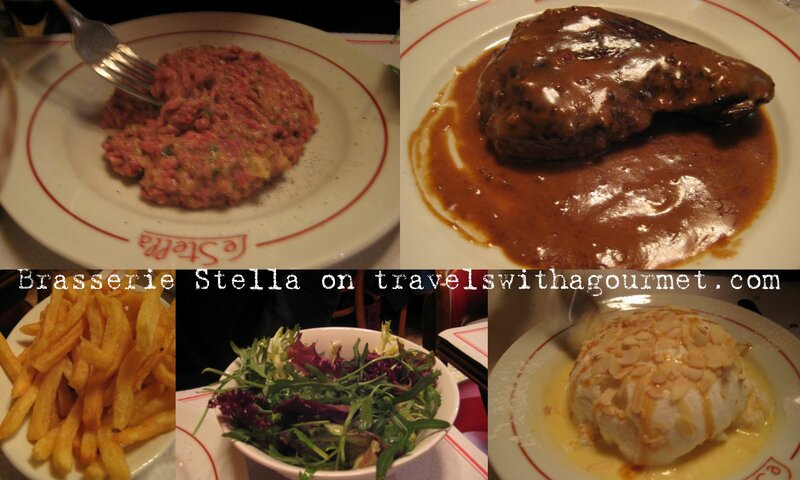 The steak tartare was excellent – spicy and perfectly-seasoned and came with a green salad. Both dishes were very good and exactly what we wanted. To end the meal, we shared another classic – ile flottante (which A defended as a “healthy” dessert since it was made of egg whites). Espressos to finish and the bill which was surprisingly low. The food was delicious, reasonably-priced while the service was friendly and faultless which is why Stella has remained, after all these years, a neighborhood favourite.